Jeddah Tower ... the skyscraper’s unique, circular, glass-floored sky terrace will also be supplied by Guardian Glass. Guardian Glass, one of the world’s largest manufacturers of float and high-performance energy-efficient coated glass products, said it has won the contract to supply façade glass for the one-km-high Jeddah Tower, being developed by Saudi Arabia’s Kingdom Holding Company. The Jeddah Tower (previously known as Kingdom Tower), on completion in 2019, is set to become the world’s tallest building. The $1.2-billion-plus supertall building structure will cover an area of 5.3 million sq m and include 439 apartments, 200 hotel rooms, 59 elevators and 2,205 parking spaces. It is set to break new world records for tallest building, highest occupied floor, highest architectural top, highest tip and highest sky terrace. As per the contract, Guardian Glass will provide more than 400,000 sq m – the area of approximately 55 football fields – of aesthetic and functional glass panels that meet the iconic landmark’s complex energy and performance requirements. The glass chosen for the massive structure is a custom-made, double-pane glass system combining Guardian Glass’ popular SunGuard Silver 20 and SunGuard Neutral 60 coated glass products, said the US-based company. The robust technology is made to withstand a 2.5-m radius sway without breakage or leakage, it added. “For that reason, we have combined two of our most popular and reliable Guardian SunGuard products that we are confident will offer the best performance without compromising aesthetics,” he states. As a high-performance, solar-reflective coated glass, the exterior SunGuard Silver 20 pane will help block daytime heat yet allow for abundant natural light and provide a luxurious silver-green aesthetic. The interior pane, with SunGuard Neutral 60, will help protect against indirect night-time heat. The unique, circular, glass-floored sky terrace. 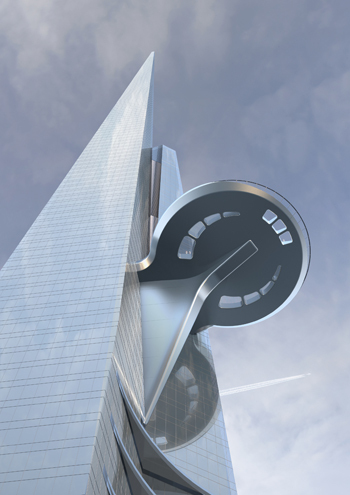 The skyscraper’s unique, circular, glass-floored sky terrace, located more than 2,000 ft above ground level, will also be supplied by Guardian Glass. 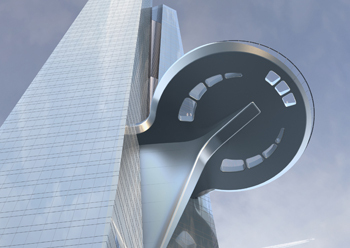 Once completed, the new world’s highest sky terrace will overlook the Red Sea. The glass will be manufactured at Guardian’s Al Jubail plant – Saudi Guardian International Float Glass (GulfGuard) – and then delivered to United Arab Aluminium Company’s (UAAC) factory in Jeddah, where the glass will be processed into double-glazed units, structurally glazed to the frame with high-performance secondary structural sealant applied. The fully assembled curtain-wall system will then be delivered to site for installation. Guardian Glass says its trained and certified Technical Advisory Centre (TAC) team of experts will be available to provide round-the-clock support on the project to optimise results. “An onsite team will work closely with UAAC to provide consistent supervision, maintenance and long-term post-project service,” remarks Al Ibrahim. Jeddah Tower will be an exciting addition to Guardian Glass’ extensive portfolio of iconic landmarks and developments in hospitality, retail, residential, corporate and institutional properties in the Middle East and around the world, he adds. GulfGuard is a joint venture between Guardian Industries and the National Company for Glass Industries (Zoujaj). GulfGuard has one of the newest and most advanced sputter coaters in the region for the production of high-performance, energy-efficient glass products. In addition to GulfGuard, the company also operates a plant in Ras Al Khaimah, UAE.